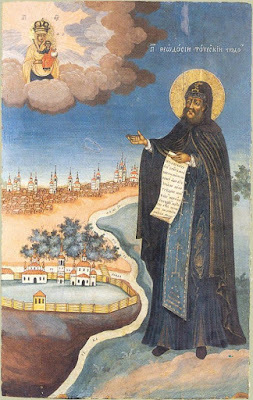 Venerable Theodosius was born at Vologda about the year 1530. In his youth he was raised in a spirit of Christian piety and the fear of God. At the insistence of his parents he married and had a daughter named Marina, but family life did not turn him away from God. He went frequently to church and prayed at home, particularly at night. 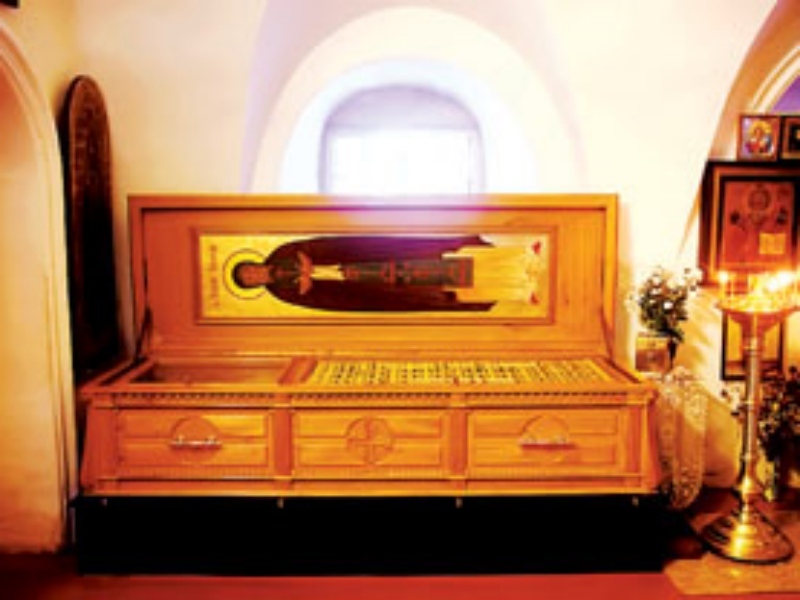 After the death of his parents and his wife, he left his daughter with relatives and withdrew to the Savior Priluki Monastery not far from Vologda. At the monastery Theodosius passed through the various obediences: he carried water, chopped firewood, milled flour and baked bread. He also went to Totma at the abbot’s orders to look after the salt refinery of the monastery. His management was such that never before did a salt mine bring in as much income as with him over it. While there he sought the permission of Tsar Ivan Vasilevich and the blessing of Archbishop Nicander to found a monastery at Totma. Theodosius was appointed head of this newly-formed Totma Monastery, which previously had been the now desolate Saint Nicholas Ephraim Wilderness Monastery, which in a grant of 1554 was declared free of taxation. 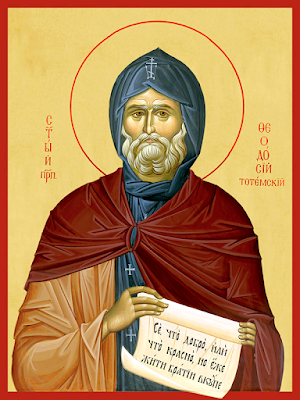 The Saint founded the Totma Ephraimov Wilderness Monastery and brought brethren into it. There he built churches of the Transfiguration of the Lord and Nicholas the Wonderworker. Eventually becoming the head of two monasteries, which now included the Savior-Sumorin Monastery, Theodosius continued to lead an ascetic life. He wore down his body by wearing chains and a hairshirt, and beneath his monastic cowl he wore an iron cap. Fond of spiritual reading, he acquired many books for the monastery. He acquired not only liturgical books, but also expensive for those times theological works of Saint John Chrysostom, Saint Ephraim the Syrian, and other teachers of the Church. 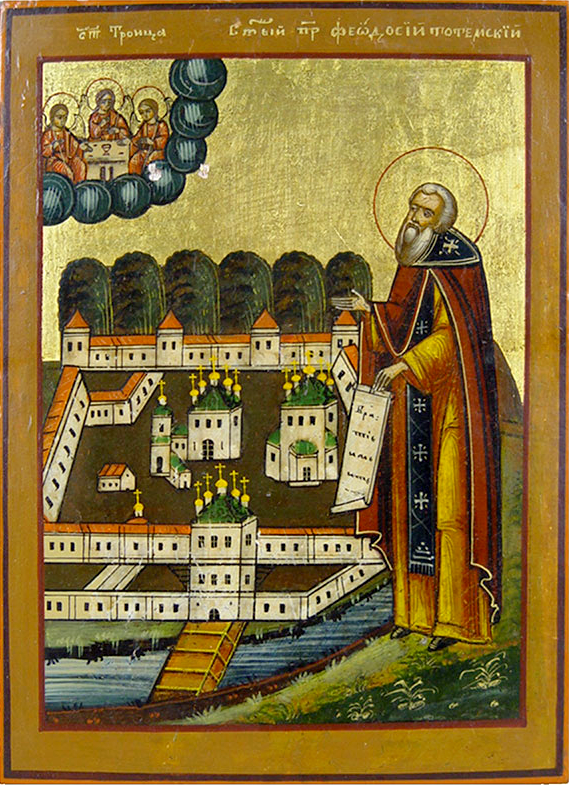 Saint Theodosius reposed in the year 1568 and was buried in the monastery he founded. About one hundred and fifty miracles are recorded to have occurred at his grave. On September 2, 1796 during the reconstruction of the Ascension Church, his relics were found incorrupt, and their glorification took place on January 28, 1798, on the day of his repose. He was buried at the Savior-Sumorin Monastery. On April 17, 1919, the relics of Saint Theodosius were uncovered as part of the Soviet campaign of "opening the relics," and they were brought to the Vologda Regional Museum. In 1988, in the year of the 1000th anniversary of the Baptism of Rus, they were transferred to the Vologda diocese and were located in the Lazarevsky Church of the city of Vologda. In 1994, the solemn transfer of the holy relics to the city of Totma took place, where they were placed in a shrine in the Church of the Nativity of Christ. On September 15, 2016 a solemn transfer of his holy relics took place from the Church of the Nativity of Christ to the Ascension Cathedral of the Savior-Sumorin Monastery.